Smoke and Mirrors, is just as enjoyable to read as the Zig Zag Girl , its up follows in the Mystery men series. Christmas has come to Brighton and locals are eager to see the new production of Alladin starring Max Mephisto but Di Edgar Stephen can’t feel the holiday spirit. He has the murder of two children, brother and sister, to solve and the candy trail in the woods near the bodies is an eerily ode to the fairy tale Hanzel and Gretal. 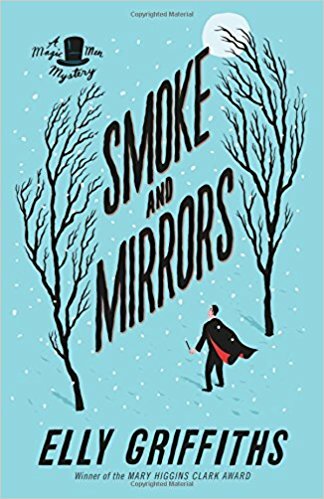 I enjoyed Smoke and Mirrors the mystery gets drawn out just right, not overdone at all . Further Griffin offers no misdirection to trip up the reader as the mystery unfolds and although I did not pick up on who the murder is nor,I did not feel cheated once I did find out and the motive behind the murders. I also liked learning more about the theater and what happens behind the scenes as well as about familiar and unfamiliar fairy tales that one of the murdered children Annie, felt so captivated by. And I liked reading what is happening in Edgar and Ruby’s relationship as well as seeing Max have his own relationship begin. I now await the third book, The Blood Card, to see what happens next with Max, Edgar, Ruby, Emma and Bob.